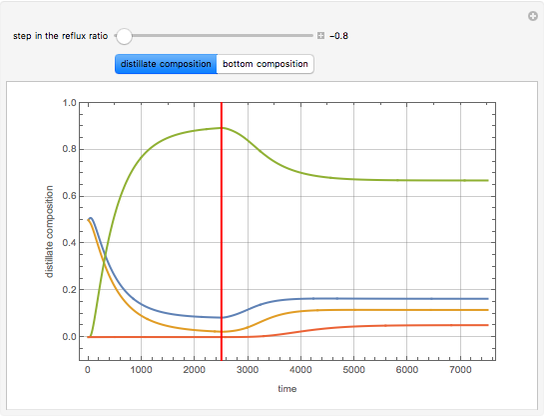 Consider a quaternary mixture of components , , , and with relative volatilities , , and . This mixture is subject to an equilibrium-limited chemical reaction with reaction rate , where the equilibrium constant . The mixture is fed to a reactive distillation column with 15 plates. The feed stage location is stage number 10, the reactive stages are stages 6–14, and the feed composition is equimolar in and (i.e., the feed is composed of 50 mole % and 50 mole % ). The feed, a saturated liquid, has a flow rate of 10 kmol/min. For simplicity, constant molal overflow (CMO) is assumed and heat effects are neglected. The molar hold-up of the condenser and reboiler are set equal to 2000 and 5000 kmol, respectively. The hold-up in the reactive and nonreactive trays is chosen equal to 200 kmol. The reaction rate constant is 5 and the Damköhler number, defined by , is 100. 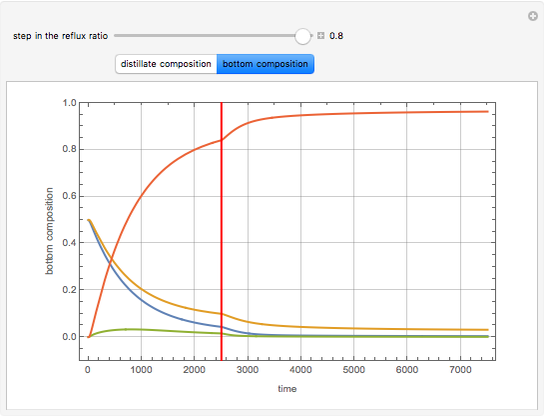 This Demonstration shows the distillate and bottom compositions versus time for components , , , and (in blue, magenta, brown, and green, respectively) when the column is subject to a step in the reflux ratio at min. The distillate and bottom flow rates are equal because the reboil ratio, , and the reflux ratio, , are chosen so that . 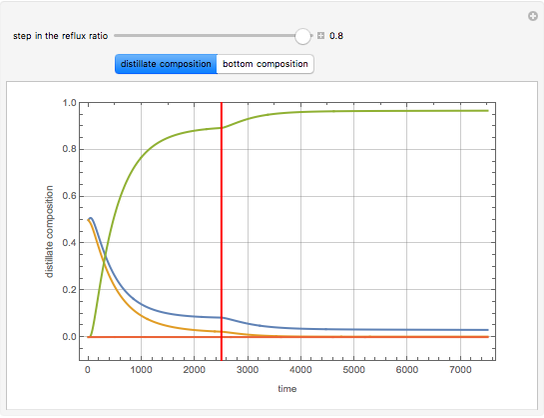 You can select the magnitude of the step in the reflux ratio by setting the value of parameter defined by for min and for min. Housam Binous, Selmi Manel, Ines Wada, and Ahmed Bellagi "Dynamic Behavior of a Reactive Distillation Column Subject to a Reflux Ratio Step"